From the first Spanish expedition into Alta California in 1769, the vaquero played a significant role in California’s heritage. Vaqueros, or horse-mounted livestock herders, originated on the Iberian Peninsula and were brought to the Americas from Spain. The vaqueros of the Americas were horsemen and cattle herders in Spanish Mexico who came to California. The vaquero “culture” developed into a fine art through the Mission and Rancho eras, and continued into the early 1900s. At the Rancho San Andres Castro Adobe, herds of cattle and livestock grazed the land under the mounted vaquero’s watchful eye. The vaqueros were skilled in the use of the rawhide riata for cattle sorting, roping, branding and slaughter, as well as roping grizzlies. The rider and the horse worked in partnership with the slightest of “cues” hardly noticeable. True horsemen were held in highest regard for their patience, knowledge and skills regarding horses, cattle and the land. Today, the history, horsemanship, equipment, knowledge of land use and lifestyle of vaqueros are revered traditions. Learn about the vaquero culture and view a demonstration of vaquero-style horsemen at Vaqueros on the Rancho, a ticketed fundraising event at Castro Adobe State Historic Park on Saturday, May 6. 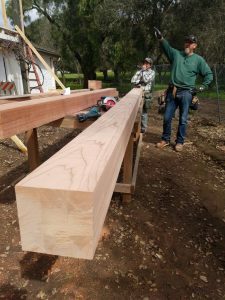 Contractor Brian Bogaard and the new 6 ¾ x 6 ¾ beams before installation. 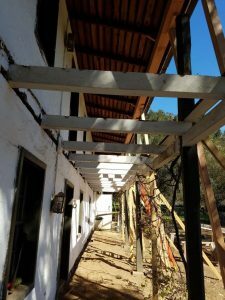 Work is progressing on Phase 3 at the Castro Adobe. This work includes restoring the balcony and stairs, and installing a wood boardwalk underneath the balcony. This also includes the final piece of the seismic retrofit with the installation of the cable wrapping around the center of building. As part of the work, the non-historic balcony, stairs, columns and pavers were removed. Taking down the balcony exposed the pockets for the original balcony floor joists which indicated that the balcony was originally cantilevered. Work this week and next continues with the installation of a concrete slab for the boardwalk and the footings for the columns. New beams installed at roof. Joists removed showing original joist pockets. Yovania Paniagua recently started as an Interpretive Park Aide at the Castro Adobe. Yovania got connected with the Castro Adobe when she visited the park with her daughter’s school field trip. “I fell in love with the place,” Yovania said, whose dad (pictured with her on her first day) played a big role in her love of the woods, the environment and educating people. She started volunteering at the park in June of 2016 and officially started as a Park Aide in February 2017. 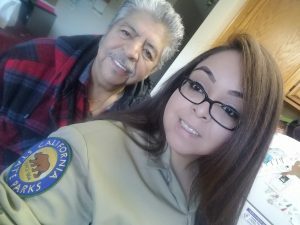 Working for California State Parks has always been a dream for her. Yovania said she loves talking to visitors about the history of the park, meeting new people who share her interests and being outdoors all day. She also is bilingual and helps with translation for visitors. “I wanted to work at the Castro Adobe because I love the history behind it and it’s right in my back yard,” Yovania said. Castro Adobe State Historic Park is at 184 Old Adobe Road in Watsonville. The park which is undergoing a multi-year restoration effort led by Friends of Santa Cruz State Parks, is currently only open for prescheduled tours, monthly open house events and special celebrations, such as Vaqueros on the Rancho on May 6. Castro Adobe State Historic Park will host monthly open house events in 2017. Located at 184 Old Adobe Road, Watsonville, the two-story Rancho San Andrés Castro Adobe, built between 1848-49, is one of the finest examples of a rancho hacienda in the Monterey Bay area. 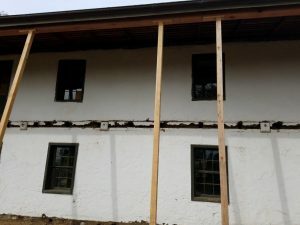 The Castro Adobe is open on a limited basis as Friends leads a multi-year restoration effort to preserve and interpret Pajaro Valley’s first State Historic Park in partnership with California State Parks. Saturday, Jan. 21, Beginnings at the Adobe: The Castro family has been at the leading edge of California history. Saturday, Feb. 11, Romance on the Rancho: The adobe has hosted its share of love and loss. Saturday, March 18, Luck o’ the Castros: Luck comes and goes. Good choices have preserved the Castro Adobe. Saturday, April 22, Vaqueros y Bandidos: Connect to when cattle ranching was king on the California coast. Saturday, May 13, Women of the Castro Adobe: Honor the women who helped preserve the Castro Adobe. Saturday, June 17, Papas of the Castro Adobe: The fathers of the Castro family etched their name into the CA landscape. Saturday, July 22, The Castro Adobe in the American Era: The Castro Adobe influenced the development of the Pájaro Valley. Saturday, Aug. 19, Evening at the Adobe: A state historic park, the Castro Adobe is a place for community celebrations. Saturday, Sept. 16, The Pájaro Valley in the Mexican Era: The ranching lifestyle shaped the society we live in today. 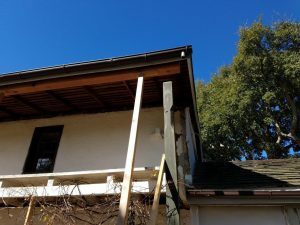 Saturday, Oct. 14, Earthquakes and the Adobe: Adaptations have helped the building survive shaky ground. Saturday, Nov. 18, Thankful for Our Stewards: Our stewards have key roles in Castro Adobe’s history and future. Saturday, Dec. 9, Festivos en el Rancho: Celebrate the holidays season! All events are 11 a.m. to 3 p.m. with the exception of Evenings at the Adobe on Aug. 19, which will be 6-9 p.m. Admission is free; donations are gratefully accepted. Parking is limited; please carpool. I want to share with you something very heartwarming that took place at the end of a school tour at the Castro Adobe on Friday, Dec. 2. We had 19 kindergarten children from Watsonville Charter School for the Arts. They had a very good time. They did roping, tortilla making, adobe brick making and checked out the bear skin. It is such a joy to see very young children take their minds to places that we adults will never understand … or maybe we just lost how to do it. At the end of the tour, their teacher handed me an envelope and said, “What a great time they had.” On that envelope was all of the 19 children’s names and inside the envelope was $47.50 in cash. Each child had donated $2.50 for the Castro Adobe. It was so very heartwarming! The open house, “Earthquakes and the Adobe,” will be 11 a.m. to 3 p.m. Saturday at Castro Adobe State Historic Park. Learn more. The book also will be available in the ParkStore at Santa Cruz Mission State Historic Park. The free tours are 2.5 hours long and offer curriculum that supplements teaching of third grade (local history) and fourth grade (California history) content standards. Email Interpreter Joseph Carr Ritchie or call 831-226-9669 to schedule a visit. Learn more about field trips to local State Parks and Beaches. Grants totaling $1,054,800 were made to 54 nonprofits in our latest round of funding by Community Foundation Santa Cruz County, including a $20,000 gift to Friends of Santa Cruz State Parks for further restoration of the Castro Adobe, California’s newest State Historic Park. The gifts were announced in late August. Read more about the grants. After years of planning, design modifications, site preparation and funding procurement, the steel beam which will support the second floor was installed on Friday, May 13. The beam was carefully brought into the building and inserted underneath the second floor joists by Sea Berg Metal Fabricators, Inc. The steel beam was cranked and lifted into the place, running the entire length of the adobe building. Everyone on the site was ecstatic at the install of the beam and emotions ran high as the beam, so long in the planning, was finally installed. 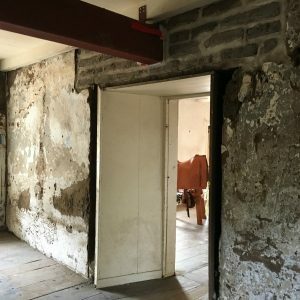 A long-term goal of the Castro Adobe renovations is to increase access for all. The beam strengthens the second floor of the historic structure, making it possible for a larger number of visitors to go upstairs. This picture doesn’t do it justice. Come see the beam for yourself at the next Open House Day , 11 a.m. to 3 p.m., Saturday, June 11. 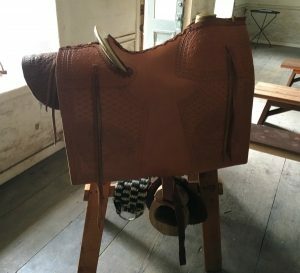 A custom replica 19th Century “Californio” saddle was unveiled at Castro Adobe State Historic Park during the April open house event. San Juan Bautista State Historic Park docent John Grafton crafted the period-specific saddle especially for the Castro Adobe. He attended the open house to demonstrate the materials, tools and techniques he used, and visitors got to try their hand at leather-working with him. Much like the Castro family who built the adobe, John Grafton has made cattle a way of life. His childhood and early career took him to ranches throughout the West—of both North and South America. 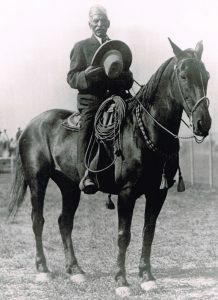 During and after a later career in law enforcement, John developed a relationship with California State Parks as a docent specializing in hands-on demonstrations of the horse culture of early California. He currently volunteers at San Juan Bautista State Historic Park, where he does blacksmithing, leather and rawhide work, and woodworking — and combines these activities with interpretation of the material and social culture of the early Californios. Grafton said he started volunteering at Sutters Fort in Sacramento and, when the park’s administration learned he had a background in ranching, he was encouraged to create an interpretation of a Californio saddle. Tree – hand carved out of Douglas Fir wood. Stirrups – hand carved from local oak wood. Leather Coverings – all have an individual purpose. All imprinted by hand made tools with floral and geometric motifs known in the mid-1800s era. Spring will bring two more opportunities for the public to visit the Castro Adobe and view the saddle — as well as the restored cocina (kitchen), Potter-Church garden and more. Join us for “A Founding Family of California,” the story of the Castros’ arrival in California as told from the perspective of Spanish explorer Juan Bautista de Anza, 11 a.m. to noon, Saturday, May 21. The next Castro open house event will focus on life at the adobe after the Castros. The park will open for “The Castro Adobe in the 20th Century” from 11 a.m. to 3 p.m., Saturday, June 11.